I received a framed piece of art a number of years ago made by a student artist at a local college. It’s called Forward Back and it is a charcoal sketch of a human form leaning over to the left, picking up pieces of paper in the lower left corner of the page. The same person (two upper bodies on the same lower body) is standing erect, facing right, and placing the pieces in the top right corner; pieces of which turn out to be a partial photograph of the artist as a little girl. It’s hanging in my kitchen by the old bookshelf I use as a pantry. It’s there to remind me to pick up the pieces of the past that are useful and bring only them into the present and future. Winter maintenance takes diligence, though. Not falling head first into hibernation mode is an almost daily struggle. That’s why I’m glad our new year (at least in the northern hemisphere) begins in the dead of winter. While I no longer make “resolutions,” I do welcome fresh beginnings, which – for me this year – means looking to my past for ways to tweak my current thoughts and behaviors as they pertain to weight maintenance. Anyway…back to the chair. I’d made Black Bean and Quinoa Soup for dinner (which, contrary to what the recipe says, does NOT serve 4, it serves at least 12…). Two hours after eating, sitting deep in the chair, blanket up to my nose, I thought, ‘I want popcorn.’ If I followed my typical behavior of the last several months, I’d have gotten up, made popcorn, and plopped back into the recliner with my popcorn. But something about the word “want” really stuck in my head. I decided to be mindful and turn the thought into a question: ‘Do I need popcorn?’ I checked in with my stomach. “Nope,” it said. “All good here.” So I resumed playing Words With Friends and texting and watching the Vikings gets their butts handed to them on YouTube. I woke up Sunday morning with a sense of control I’d not felt in a while. A balanced control, somewhere between jelly on toast and popcorn before bed with moderate exercise in between. I think that’s the crux of change: choosing to learn to learn. And for me, part of that learning is relearning lessons from my past. I learned a lot of things losing weight, both this last time and all the times before. Those lessons built on themselves until I found better-than-average success this time in maintaining my weight. Winter maintenance. 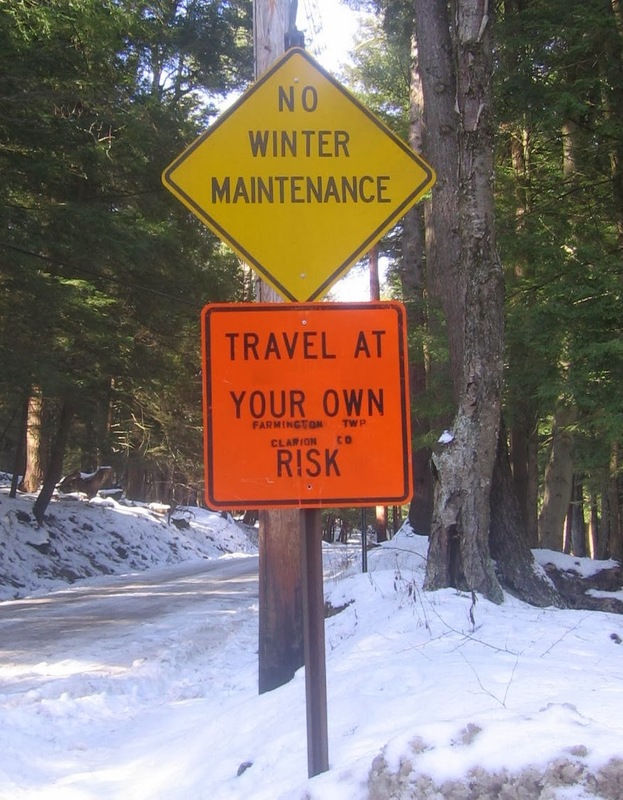 Travel at your own risk. But travel with lessons learned from your past. May they serve you well in your winter journey. To help advance (and organize!) the conversation about weight maintenance, we’ve added a new segment to our monthly AIM posts: Ask Us (almost) Anything. There’s even an easy peasy form for you to post your questions about weight maintenance, weight loss, exercise…whatever you’d like to discuss (except, perhaps, the meaning of life, to which we will refer you to the Monty Python movie). Just click this link! Every one of us (that means ALL of us, not just the AIM group) experience weight-related issues differently and, as you well know, we all benefit from sharing ideas, struggles, successes, and most of all questions. We will address questions in this space each month. We look forward to your input! This entry was posted in Weight Maintenance on January 6, 2014 by Lynn Haraldson. OMGOODNESS I love that photograph. It has been interesting and a little surprising how I CRAVE more comfort'y foods now that I reside in a place which is cold. Carla, it's definitely a western PA sign! LOVE, LOVE the sign.. I weigh 2 pounds more in the winter in weight maintenance. Not due to eating, but more due to cold sleeping weather, I've decided. A little bit of sub cutaneous fat on my hips (but not the disease causing abdominal fat). I comfort with non-food ways- hot showers, blanket on the couch, iPhone games (works!!! ), going to sleep sooner. Winter weight maintenance is different than my summer weight maintenance, for sure. Learning not to binge eat around this time was key. Glad to say I'm in remission. LOVE the 'balanced control' phrasing. That's the whole concept of maintenance in two words. John and I are both struggling more with winter this year. Not sure if it is the large amount of snow we have gotten so early in the season or the bitter cold (or both). I have been taking extra vitamin D in the hopes that will help some. Losing weight shouldn't be as hard as many people try to make it. People who are desperate to achieve weight loss are often prone to take more risks. The only reason most people fail in their fitness goals is that they have good intentions at first to adopt a new lifestyle, yet after a few weeks or months, they abandon their good intentions and slip right back into their old bad habits that gave them the excess body fat in the first place. And of course an excellent Spring!